In the Talkeetna Mountain Range east of the Parks Highway between Willow Creek and the Kashwitna River, the Willow Mountain Critical Habitat Area supports some of the largest concentrations of moose found anywhere in the state. Located along the western slopes of Willow Mountain, the area encompasses both the upper extent of mixed forest and the lower alpine zone. 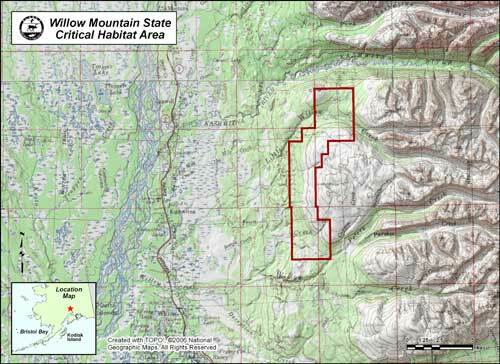 For current land status information, see the Willow Mountain Land Status Map (PDF 467 kB). You may also download the KML file which depicts the refuge area boundary.